The sale of lager was up 11.6% compared to the same 12 week period last year. IRISH SUPERMARKETS HAVE seen a boost in the sale of beer and water this summer compared to last, with retailers reporting an overall rise of 3.1% in sales during the recent summer heatwave. 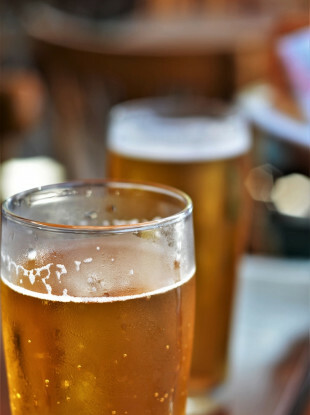 The latest figures from market research firm Kantar Worldpanel reveal that soaring temperatures saw the sale of lager up 11.6%, the equivalent of an additional 7 million pints, compared to the same 12 week period last year. “While the hot weather will have provided a welcome boost to overall lager sales, so to will the recent World Cup in Russia,” Douglas Faughnan, consumer insight director at Kantar Worldpanel said. Despite Ireland’s association with stout, it is lager that is actually leading the way – 42.4% of households bought lager at least once in the past 12 weeks, as shoppers took advantage of the sun and the football. The same period also saw bottled water sales grow by a quarter with Irish shoppers buying bottled water on 1.8 million more occasions compared to last year. “A number of things may have influenced the surge of bottled water sales in Ireland – in particular the recent weather, speculation surrounding water shortages and this month’s hosepipe ban, “ Faughnan said. Tesco was the only supermarket to increase its market share accounting for 22.5% of grocery sales in Ireland during the 12 week period ending 15 July 2018. SuperValu came in second place with 21.9% of the market, marginally ahead of Dunnes on 21.2%. Meanwhile, Lidl and Aldi now account for 11.9% and 11.5% of the market, with both retailers seeing growth in sales. Email “Additional 7 million pints of beer sold this summer compared to last ”. Feedback on “Additional 7 million pints of beer sold this summer compared to last ”.